No plans to release on AE yet but I am open to the possibility once I can clarify the legal status of issuing these types of shares in more detail (if anyone has knowledge on this, please let me know). Will you work some of the new design elements into your site? Yes, we have a new wallet layout coming next week along with new functionality. We are going to support AE in the blockchain explorer and have many other developments planned including new products. What do I really have when I get an online wallet with you? With a normal next account I can access my nxt address on any client as long as I know my pass phrase. In your case, I cannot. I do not know the passphrase that corresponds with my account address. I only can access and control the account with the username and password access on your site. Are you generating a passphrase on your side? Any insight on how this works is appreciated. Thanks. My question is more about what's under the hood? Where's the account passphrase that corresponds with the NXT address? Who am I trusting and with what? Yes, this. The main thing is being able to access your NXT from anywhere (work computer, home computer, mobile, etc). It's geared towards newcomers and non-tech savvy users that can't t or don't want to install the client in their local machines. You are trusting mynxt.info and me. It is the same as blockchain.info or coinbase.com. With time, we will allow our users more control over the account (as I mentioned above with the ability to download your wallet account keys and client-side transaction signing). At the moment, it is not like blockchain.info. I can still get to my bitcoins if their site is down or disappears. I retain full control of my private keys. They cannot view or access my bitcoins. None of that appears to be true with your online wallet. I understand from your post here that you are planning to implement some of these concepts. But it still seems that I need to trust your site. If you are gearing towards newcomers, perhaps you should make that more clear on your site. It seems with Wesley's testnet online client, I can have direct, trustless access to my nxt address from anywhere?? At the moment, it is not like blockchain.info. I can still get to my bitcoins if their site is down or disappears. I retain full control of my private keys. Well, blockchain.info has one approach, coinbase.com has another an both are doing just fine. I tend to like the blockchain.info approach better and this is why I am planning to allow users to download their own keys as I mentioned. So this issue goes away. They cannot view or access my bitcoins. Not really, they can view your bitcoins any time they want since the blockchain is public and they know your public key. If someone decides to host Wesleyh's wallet on a server and make it available to everyone, then yes - in fact we may do this in mynxt.info. Blockchain is unable to view my bitcoins. Yes, the blockchain is public. But nobody know which address is mine. My understanding is that Blockchain cannot associate my public key with my email address or any other account identifier. You can. Thank you for your timely responses to these questions. I appreciate your work and do have some small amount of nxt in your online wallet, which I would certainly use more often if I were doing more regular transactions in nxt. I would not use it to hold my long term stake, and I understand your wallet is not geared for that. I'm looking forward to the improvements you described. Thanks again for your work on this and your quick response to my questions. Also, I use your block explorer all the time. So thanks for that too. If this is true then how come they have a "forgot my identifier" link where you type your e-mail and they send you your identifier? I think these things (block explorer, online wallet, etc) are a necessary part of a healthy crypto eco system, and this is the reason why I built them and will improve them and continue to build new products for NXT. They can associate an account identifier with an email address, although this is optional. But they cannot associate either of these with a public key. That is my understanding. You pass the identifier to the server and it responds with an encrypted payload which is decrypted in-browser. Yes, that's right, your identifier is related to an encrypted public key (or wallet). From the 1M+ users, I am sure the vast majority uses an email address, so the only difference with mynxt.info is the fact that the public keys are also encrypted and are decrypted client-side. We can implement the same approach, I will look into it when we get to the point of implementing the client-side signing. We have fixed an issue that was preventing new users to sign up to the online wallet. Anyone that tried to register in the last few days and got the message "Could not connect to the NXT Network" can now try again and it will work. Apologies for any inconvenience caused. Hi, can not send from my-wallet NXT. Still says "Could not decrypt your wallet. Please check your password and try again". Master password is good. Please help. Thank you. Thanks! Its showing properly now. The only other thing I need now is for my coins to arrive from Craptsy. My balance is still showing 0 and my block explorer shows a balance. However, I'm unable to send coins because of this. When I try to send a coin after entering my password, it says, "Unspecified error ocurred. Please try again". Is this because my balance shows 0? edit: arggghhh, now the balance is showing and i was able to send. The charts now allow you to select a different time window (12 months, 6 months, 3 months, 1 month, 1 week). They will auto-update within the next 3 hours. Things will start to stabilize now. I am also going to make improvements in the whole system in the next few days that will make it more resilient. Many improvements to the block explorer! Too many to list, but basically there is a lot more data and visualizations available, you can see detailed transactions data from each block, easily list all the blocks all the way to the genesis block, see all the transactions of any account and everything with pagination. I am using your Alerter for NXT transactions, but I want to stop it. There is a link in the mail, but it doesn't work. Can you help? Yes, I'll fix the link and let you know. I've registered an online wallet and received the registration email. I clicked on the link in the email and it took me to your website (don't remember the message there). Just use the "forgot password" link, forgetting the login password is less of a problem. But please make sure you know your master password once you log in (send a small amount of NXT and then try and transfer it out) because if you forget/lose your master password, there is no way to recover it. I'll pm you my email addy for investigation, though it's not urgent! I just create Nxt Online Wallet and I seem not to know in the wallet what my wallet address! Is it my email? Can somebody help with the answer! When logged in, click on "Wallet Home". You will see "Your Nxt Address"
The problem is this: Our public nodes are getting DDOS'd. Because of this some of them enter a fork and then our block explorer doesn't know which nodes to trust anymore and gets stuck. I have been working on a solution. It will hopefully be online this week. In the meantime, I have to keep manually fixing the nodes every time. I just did it now, and the block explorer is catching up again and will be updated in a few more minutes. Sorry about the hassle. Your account has 50 NXT in it. Are you saying that your balance is not showing up in the wallet? Has there been any talk about implementing QR codes on NXT wallets and having the web wallet be able to access the mobile camera to simplify sending money and displaying the QR code to eliminate typing errors? It seems that the web wallet could pioneer that and the desktop wallets could follow suit. But, it certainly seems a feature tailor made for mobile devices and a web based wallet. I will look into this, sounds like a real good idea indeed. Is this true? If so, seems a big issue. I was looking into this wallet, but if I can't get the pass phrase it uses so I can just plug that into some other wallet it makes it a bit more risky. With blockchain.info I have my wallet and all private keys. They email it to me any time the wallet changes. Yep, this will be available guys. It's just that I have been a bit too busy getting other aspects of mynxt.info in place, putting a team together and many other things and we haven't been able to focus on the wallet. Until now that is. Starting next week we will start delivering a new wave of improvements to the wallet, you're going to love it. And allowing you to backup it and see your private key is one of the things in the list. Why not just use 1 password, the original nxt passphrase? This way you can access the account created on your website, also via other clients, and I can access accounts I created via wesley client also on your website? The new block explorer is live! Today I have entered into my wallet and saw that my balance on the startup page shows up 0, like other fellows said! Hasn´t been it fixed yet?? Sorry about that, things are back to normal now. We had been busy working on the new block explorer and now we will focus 100% on improving the wallet so this type of problem doesn't happen again. Seems the explorer is pretty slow -- especially if you click on an account somewhere. Should be much better now, please test and let me know if you still have problems. Edit: No, still slows down sometimes. Needs improvement in performance. Okay, I made many optimizations. Timings have improved a lot. The only place where it's still not where I want to it be is in when listing accounts. We are working to improve this as well. Cool new feature in the block explorer: See all values in NXT, BTC, BRL, CNY, GBP, EUR, USD! Just use the drop-down at the bottom. Have fun! Average of 60 new accounts created per day. That's not too shabby. I see that the minimum total aliases of an account is always 1, even though there was none registered. Is this a bug? Yes, it's a bug and has been already corrected in the dev server, I need to pass it over to the production server which will be done in a few hours. The balance showed up correctly the day after! Good. We are now actively working on the wallet on the dev server but we have not committed any new code into the production server for a long time. This means that the stability improvement is not yet there, so you could still face this problems of funds not showing up and then showing up again later. But this will all get fixed once we commit the code. I have received a revenue, but the balance has been late very much in be updating. is it normal to wait for so much time? Are you talking about the block explorer or the wallet? If your balance shows up in the block explorer, then the money arrived. If it's not showing up in the wallet, have you tried clicking "refresh" on the top-right to refresh your balance? in blockexplorer if it turns out to be rapid but in the wallet not. how much are confirmations necessary to reflect a revenue? We implemented many changes in the way the wallet communicates to the nodes. It's much faster and much more stable now, so take a look and see if your balance appears correctly now. The problem was yesterday when i was expecting a income in my wallet. In blockexplorer appeared quickly, but in my wallet took more than 40 minutes and more than 20 confirmations. With 20 confirmations recharge the balance and still did not appear. The problem was that I wanted to make a payment and i couldn't until the balance is updated correctly. It might be a specific problem, if I happen again i will comment. I sent some NEMStake to my mynxt.info account. Sadly I can't see anything besides the transaction history in the wallet. Is there any way to send it back to my local client, or export my passphares? I suppose Assets aren't supported yet. They are in your Account but you can't do anything with them, yet. @abuelau since user assets are not supported yet, can you manually help me to send the asset to my other local account? When the wallet was created asset exchange didn't exist so Bitcoinpaul is right - it's not supported yet. That being said, our team is working intensively in the wallet (after having finished a wave of improvements in the block explorer). I don't want to announce everything yet, but I can tell you that we will be able to easily deal with your issue when this work is done. So I will need to ask you to please wait another few days. After the improvements done yesterday, it should not happen any more. I have just made a income and the balance has been updated instantly. Very happy to know that. Thanks for all the work! Nxt online wallet is very similar to blockchain.info's online Bitcoin wallet. The main objective is to make it dead-easy for new users to join Nxt without requiring downloads, java installs, or waiting for downloading of the blockchain. The Mynxt.info online wallet was also re-skinned into the Nxt corporate design. salsa, are you working for MyNxt? I am happy to announce that the wallet https://wallet.mynxt.info is now running on the client-side encryption code. We will be posting the source code tomorrow in github. It was nice seeing you too. Hope you had a great trip back home. a Secure environment my question to you tho is how do we know this is as Secure as the NXT Client? You know the alerts that you do, is it possible to monitor a node and get an alert if it goes down? Would this be useful or are all nodes up 24/7 as they are run in big server farms? I think this would probably be a better fit for crimi from peerexplorer. The alert system we have today works by looking at the blockchain and identifying events that should be sent to users. To monitor servers would something completely different. You can now export your mynxt.info wallet, open it in another client and manage your AE. The forge calculator seems broken. I tend to give this one to noobs, so found it pretty handy. Thanks for letting us know, it's working again now. How can I export my wallet ? Hi, can you please send an email to info@mynxt.info from your registered email address? I will personally look into this. Just wanted to quickly say that I am really impressed by this website and the layout and functionality is well beyond what I usually see within the crypto space so a big fat thank you to the devs and coders and artists that are behind this, keep up this great work! Apologies if I can't see what's in front of me but I can't see the button to access transaction history - has it been removed or is it hiding in plain sight as it were? 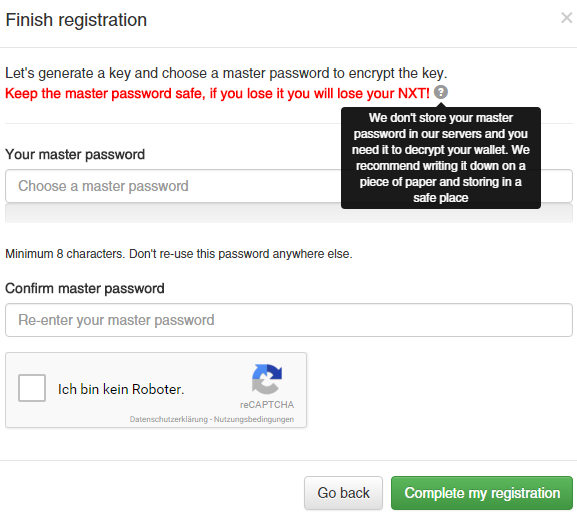 when I try to download wallet backup, I get 'wrong master password' msg. - but I can still send NXT ok from the a/c, so it's the right master pwd. Any plans to add the facility to generate a website token? We are preparing to push an update, and one of the new features is that it will show the transactions history directly in the wallet dashboard. The wrong password problem has been reported by a couple of other users as well and we are looking into it. If you haven't done this already can you please send an email to info@mynxt.info describing your problem? For those that had the issue of not being able to download the wallet backup: We have fixed this problem and I have sent emails to each one that reported the issue asking them to clear their browser cache and try again. Does somebody know what's going on with wallet.mynxt.info? im guessing they havent updated properly? Everything back to normal. Indeed our upgrade script to 1.26 failed in all server, hence the problem. The wallet is back to normality, the block explorer still needs about 20 minutes to finish catching up with the blockchain. I have a totally newbie question. How do I access the account I created on mynxt.info in the NRS_client_1.2.6? I cant find an intuitive way to generate a pass-phrase. Take a look at New Relic. I forgot my master password. Anyway to recover this? I think I'll remember eventually. As discussed on email (and for everyone else's benefit) we don't have access to the master passwords. This is what makes our wallet secure and trustless so if you lose your master password there is nothing we can do. Everyone please make sure you keep your master password safe. I suggest you use Keepass. I've done filling the master password correctly, but why the emergence of "Wrong master password"? Why do I believe that I fill with the correct password, because before I fill the master password during registration, I recorded the first password I created with my notepad and save it. And to my login email and password do the same thing, and it was no problem. never save passowords with notepad.. use a password manager like keepass..
Ok, maybe for the future I will try to do that. I havnt ever done anything on my nxt so there's nothing really I can help with irt your issue,. just thought I would mention it about keepass. Please send an email to info@mynxt.info from your registered email and we will take a look at it. Please send an email to info[at]mynxt.info from your registered email and we will take a look at it. Is my RSUnit can be accessed from wallet.mynxt.info? Since I have received RSUnit using NXT address of RSUnit wallet.mynxt.info but I can not be accessed and transferred from there. This is my RSUnit nxtreporting.com/?a=NXT-FPA3-K53T-UM6Y-6QRK7&c=USD but in wallet.mynxt.info not exist and can not be accessed and transferred. Will be mynxt asset issued? We are looking into it. It will probably be made available towards the end of the year / beginning of the next. And I have shared this here . recently I withdraw Nxttycoins from Bter to my wallet.mynxt.info. I think that I have to export a backup wallet to use with an asset client, right? Yes, you will need to export your wallet and open in NRS. just tried out mynxt.info. Very good website, I really like it. Will there be additional languages added? Having other languages is something that is in our backlog we just couldn't get to it yet, but it will happen. Which language would you like to see it translated to? A asset was sent to my myNxt.info online wallet address. I can see it with nxt reporting but not within the wallet. Is there a way I can transfer the asset out of the myNxt.info wallet? You can't do that at this moment. You can go to the Settings page and click the Download Wallet Backup button to get your passphrase so you can use the original client. I appreciate the work you've put into the website. I've been doing some work on the API and I've run into some problems that keep me from my goal. For almost all the queries, the prices and totals seem to be returned in different decimals. Some have 3 zeros on the end, some have 4, it seems completely random. How should I been gathering these numbers so I can calculate their value? What's the endpoint you are calling? Can you PM me an example? You realize those balances are in NQT and not NXT right? Thanks for helping me out in Slack. Just to be clear here, though, they're actually, not because wouldn't they be longer numbers? For example, wouldn't the second asset balance of 6152 should be 615200000000 if it was correctly in NQT's? The reason it seems weird is because asset owners get to decide their own amount of decimals. If we are talking about NXT and NQT we are talking about 8 decimals. But if we are talking about balance and balanceNQT of assets the difference is whatever the amount of decimals the asset owner has decided. What you can do, and what the actual NRS client does is querying the getAssets (plural) endpoint with multiple asset ids and then "merges" those data with the assetBalances data. The purpose for this is to retrieve the amount of decimals. This isn't the most beautiful solution, but it works. After you get the decimals you can do balanceNQT / (10^decimals). The alerter link on http://www.mynxt.info/alerts.php isn't working. It's back up. Sorry about this. Thanks for the quick respond! The tool was working, but the link wasn't. This is strange. We're looking into it and will let you know. Hi, the problem is fixed on the plugins. We are going to fix it in the block explorer too, right now it shows assets issued by the account, not the ones owned (this is a legacy code), we will fix it in the next few days, thanks for bringing to our attention. I tried to buy NXT Assets (pro) and end up sending out 50 NXT fee to http://www.mynxt.info/transaction/1637466225118677035 from mynxt address NXT-8YT6-KZ8Z-LVJJ-2YT7Y, but I still haven't got NXT Asset pro!can you help? Thanks! Hello. Sorry about this, we are investigating what happened and will get back to you within 24h. Thanks for reponse! I am waiting for your answer! Hello this should now be fixed and you should be able to see the plugin in your account. Apologies for the inconvenience. yes, it shows up in my account! Thanks! Great customer service! There was fix in 1.4.17 that fixed a bug. Someone is still trying to exploit the bug in the stragglers that haven't updated. Update to 1.4.17 NOW, to support the network. I'm using the free version for now, but it is only showing 20 of my 53 assets. It there a limit in the free version or is this a glitch? Is there a way to access my mynxt.info wallet without the 2FA? I just bought the Full NXT client plugin but I cannot start it. After I type in my master password and send it nothing happens... pls help! This is the full nxt plugin in mynxt that allows you to run ta slightly modified standard nxt client from mynxt (so no downloads necessary) and use it with your mynxt account. @sebaldrian: can you please let me know which browser you are using? https://www.mynxt.info/alerts.php can't alert my account 905032946862637190,said "Please enter a valid Nxt account number". Does anyone have an idea why that is? The old mgwBTC servers went offline (see here the announcement), and now the MGW v2 service runs in new servers, using a new asset (superBTC, asset ID 12659653638116877017). Hence the MGW plugin has been deprecated, and all operations through the new gateways require the SuperNET Lite client. But no worries, late deposits or withdrawals through the old service can be recovered. We'll process manually your withdrawal and you should receive your BTC in the next hour or two. Just please remember to use the new SuperNET Lite for any coin deposits into the asset exchange. Ohh thhanks alot @VanBreuk ! Nice to be back tough! Can you guys set Nxt Alerter to RS account? Or at least add RS account? I have to use API convert RS account to digi account,it's inconvenient,and I think confuse new user. Same request from me. Please don't forget to include RS address in e-mail notifications too. Thanks! Yes, using RS format should be fine now. Still can't use RS format,Firefox 43. Please help lost my master password and can not recall it this is really bad I know and I hope you can help . Hello Jimmy, we are sorry but we have no chance to recover your Master Password. Sorry that we cannot help you with the Master Password. May I offer a suggest,can you add a simple input box,so user can Broadcast transaction. I have been thinking about the same already. We are still busy implementing the new Nxt features that are coming in and updating everything needed to the new hard fork. I will look into this when I have some time left. SERVICE NOTE: We found by surprise that the SSL certificate for the wallet.mynxt.info site expired yesterday. No warnings had been received because the Comodo account is pointing to abuelau's email, and apparently he didn't see them. We've contacted him to proceed with the certificate renewal as soon as possible. Apologies for the inconvenience of the browser warning when accessing the site, we expect the issue to be solved very soon. All the certificate update steps have been finished, https://wallet.mynxt.info is already working with no browser warning messages. Thanks to abuelau for the quick responses. Use the open source project Let's Encrypt instead. Free SSL certs, big sponsors, and an easy walk through on installation and automatic renewal. Thank you. Yes, we know Letsencrypt (noashh at SuperNET slack did introduce me to it weeks ago, and it's been used for several projects at SN) but in this case updating the existing cert looked like a faster, more conservative option to preserve existing configuration and get the wallet back up as soon as possible. But Letsencrypt will be used down the road for other needs. Having an issue with the wallet for a few weeks now. "Generated Reed Solomon address different from the one in the blockchain!" Thanks for reporting the error. Do you have any problems using the wallet apart from the error message? One think I would love to see is a mobile app with the functionalities of the website. Is https://www.mynxt.info/alerts.php still working? I have been using it for a long time, but lately I don't receive mails anymore. should be working yes, nothing changed there. Anything that I could check (where you should have received a message but did not)? Actually in the last weeks I had reports of intermittent issues with the mailing service, so few days ago it was changed to a new provider. If you miss again any alert email, please let me know. I don't receive e-mails since weeks now. Service Note: The MyNxt block explorer will go offline for repairs tomorrow Saturday 28 at 18:00h CET (16:00h UTC). A hard drive needs to be replaced, so a bit later in the evening the service will be back up. The MyNxt Online Wallet will not be affected. Edit: Looks like the hoster decided to intervene earlier... we'll report once the block explorer is back up. The MyNxt block explorer is back online after today's hardware fixes. A short downtime is expected for the MyNxt Wallet server between 4 July 2016 23:00 hours (CEST) and 5 July 2016 05:00 hours (CEST). The hosting company will do an upgrade of the network switch, which will bring the server offline for a few minutes. As some users have already reported, the MyNxt wallet server is down this morning. We're waiting for news from the hoster technical support, and hopefully the wallet site will be back up very soon. The MyNxt wallet service is back up. Some users report that the performance is still a bit sluggish, and we expect the hoster to address any remaning issues after the blackout. We will consider migrating MyNxt to another hosting service so outages like this one do not happen again. Yes, the main options in that sense seem to be AWS and Azure. More pricey, though. We still have some work to do in order to make MyNxt financially self-sustainable. Sorry folks, the wallet server is down again. All the contents are safe, but there's a hardware failure that will need a replacement from the hosting service. Running diagnostics now. We'll try to get things back as soon as possible, stay tuned. Last night the hoster of the wallet server performed extensive checks in the hard drives and early today they reported that no errors had be found, so we tried to bring up the server again. It worked for a bit but then started again to fail with the same I/O errors, so the MyNxt wallet needs to stay in maintenance for a bit longer. The hoster will do now a full hardware check in the server to isolate once and for all what the issue is, we'll report as soon as it has been fixed. Again apologies for the down time, hardware issues are a pain specially since there's hardly anything we can do remotely. You may also want to consider a warm backup. For example, on Azure you only pay for your VPS while it is live. If it isn't running you only pay storage fees for the virtual hard drive. This way, as long as you have off site (not your current hoster) backups of your data, you can bring a warm VPS on Azure up in a minute or two. Ok guys, it was a tough couple days but https://wallet.mynxt.info is now running in a new server, with redundancy so potential hardware failures in the future or datacenter downtimes are not a problem anymore. The old server was giving worrying I/O errors, and after a complete hardware check support told us that they could find no problems, so we left the dedicated server at Hetzner and migrated the service to AWS EBS. A couple details need polishing (email notifications might not be 100% working yet) but we're back online. for me https://www.mynxt.info/alerts.php doesn't work. I don't get an email to confirm my valid mailaddress. Sorry - you haven't received the validation email when registering in MyNxt, or you configured an alert (for instance, for login or money sent) and the alert is not received? Some mail servers may filter out some messages as junk/spam, which can affect both. If you have problems validating your MyNxt account, please send an email to mynxt@supernet.org from the email address you used when registering. I wanted to register an account for which I want to get notifications, but I never got an email to validate my request. Then please send an email to mynxt@supernet.org from the email address you used when registering, and the account will be validated manually. Hi, folks! Why its zero Ardor balance now in Mynxt wallet? Why its zero Ardor balance now in Mynxt wallet? - not the balance, but "Ardor distribution status" - because it's over. @777Rouven . I have the same Problem since 3 weeks , support dont answer my mails ... whats going on here ?? Mynxt.info is not a website from the official Nxt Core Developers. It's a project of third-party developers, that's no problem normally, but the developer of that website is on vacation and can't fix the website at the moment. He will be back one of these days. The only thing you can do it wait unfortunately. Then you really experience the beauty and possibilities of Nxt! My problem is that when i look at assets and currencies on mynxt.info, some of them don't show a chart. For example if i try the top 5 assets, all of them have a chart except Ardor. Reloading the page doesn't help. I'm using an up to date firefox with a new profile, no addons or anything. mynxt.info do not work for 2 days now. The mynxt.info wallet is having problems. When I enter my username and password the wallet interface does not appear, but I do receive a successful login email, and no error appears on the screen. Can you have a look? Can somebody please help me. I've been trying to set-up my online wallet on My.NXT.info and this always comes up. Message could not be sent.Mailer Error: SMTP connect() failed. When I try to log in, nothing is happening, and I stay on the same page, although the notification e-mail arrives telling me that there was a successful login to my account. please i misplaced my phone. Now i cannot login to wallet[dot]mynxt[dot]info online wallet because of 2FA. you should be able to log in now without 2FA, and you can then configure it again if you wish to do so.